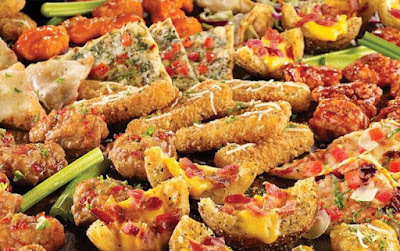 TGI Fridays has brought back their Endless Apps with Endless Choice promotion for a limited time this summer. After you pay a fixed price, they'll keep bringing you appetizers of your choice (from a limited selection) for as long as you can fill your pie hole. Previously, the Endless Apps with Endless Choice was $12 per person (without the Endless Choice, i.e. if you stuck to just one appetizer type, it was $10). This time around, they've lowered the price to $10 at participating locations, so you can keep picking different appetizers for your refills for the same price as sticking with unlimited refills of the same appetizer.